Last October our family started this fun series of children’s adventures. We had an ESL student we had hosted some time ago visiting for a few days, and it seemed like a great activity we could all enjoy. 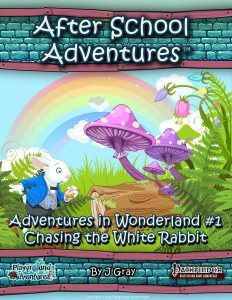 We shared a review of Adventures in Wonderland #1: Chasing the White Rabbit at that time, and the kids loved it. So much so Kelly ran the second adventure the same night with only a quick scan of the PDF before playing. The third was played the next day. Then a long time passed. Our former student returned to Japan. The kids begged and begged to find out what happened to the white rabbit. We played another fun kids adventure. And eventually a new chapter in the AIW series came out. With Rugrat #3 old enough to not be napping, but young enough she can’t quite grasp everything that’s going on, we set her up as Kelly’s animal companion. She sat on Kelly’s lap, rolling her own set of dice randomly and chiming in to repeat what people said. As gamer geek parents to a trio of rugrats, Kelly and I are always looking for ways to get our kids involved in our hobby. Something that troubles me however, is that the methods that most RPGs use to resolve tasks are pretty much the exact opposite of the values we are trying to instill into the ‘rats. It isn’t that we are utopian idealists; the ‘rats are still pretty young. The whole fantasy-reality divide is still a pretty complex notion for them. Rugrat #1, age 7, is sweet and sensitive; he finds violence scary and wants to find a diplomatic solution to every in-game challenge (this is not mirrored in his interactions with Rugrats #2 and #3; violence and disdain are his go-to methods for handling disagreements with them). Rugrat #2, age (nearly) 5, wants to hit everything. Hard. Finding the balance point between the two styles of play can be a challenge. Additionally, we frequently tell the Rugrats that violence isn’t a solution to their problems, but in most RPGs, the reverse is often true. How do we instill the value of discussion, compromise, and compassion in real-life while laughing at the slaughter of innocent, imaginary kobolds in-game? Nonlethal combat isn’t really an answer; it is still violence after all, and while I’ve seen plenty of suggestions for pitting kids against non-humanoid adversaries, in the real world it is no more acceptable to beat up a dog, cat, wolf, or rat than it is another person. Many games feature mechanics regarding the use of social skills, but they can also be troubling, as often they revolve around intimidation (bullying) and bluffing (lying). I’ll be honest, I don’t have a lot of answers to the issues I’ve posed above; mostly I write this because I’m trawling for ideas. However, listening to the kids’ entertainment selections does provide me with a few ideas. Environmental challenges are great to pit children against. While I’m not certain that I’ve seen a full episode, I’ve heard approximately one billion episodes of Octonauts and Paw Patrol. Often the drama and challenge faced by the protagonists is provided by the environment: some innocent creature is caught up a tree / has fallen in the water / is lost… you get the idea. While I’m not keen on having them slay dragons quite yet, I can definitely see the value in having them rescue people from a village that a dragon is burning down. Stealth based challenges are also quite nice for kids. While I don’t want to teach them that sneaking around is a good thing to do, I think that letting them attempt to tiptoe around a table full of goblins who are dozing due to drinking too much bug juice is fun. It also helps to teach the rugrats that, dire as they are, there is real value in looking at a problem from all angles and selecting the best resolution method at their disposal. To further this, I think there is a benefit in placing obvious items in a challenge environment that will allow the protagonists to trap, avoid, or otherwise neutralize a threat without resorting to beating it with a stick. If the players don’t catch on to the obvious items, mention them a few times. Be obvious. These are kids. Teaching them this lesson now could very well lead to more excitement at the game table when they are older. Before I wrap this up, there are a few companies making quality RPG material intended for a younger audience. 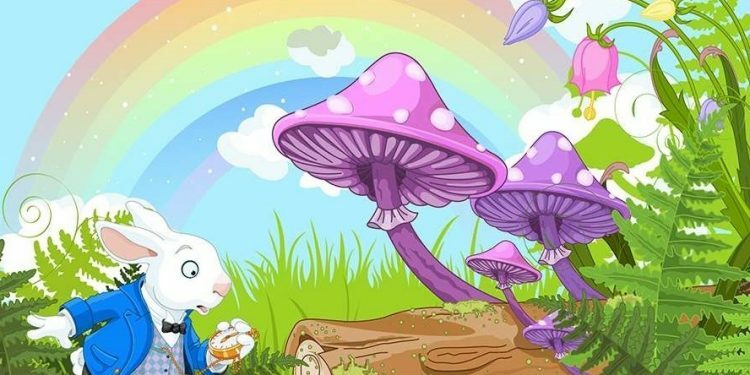 In the Pathfinder and D&D 5th Edition space, Playground Adventures has released a number of excellent modules that we’ve run for the rugrats (The Chasing the White Rabbit series by J Gray has been very much enjoyed with repeated queries from the kids regarding when the remaining parts will release). I particularly like that PGA offers adventures with diverse challenges and offers non-violent resolution methods in many cases. Legendary Games also offers the Legendary Beginnings line of adventures in both PFRPG and 5e. Legendary Games’ offerings, such as the Trail of the Apprentice Adventure Path have a more “traditional” presentation than PGA’s, and hew a bit more toward classic RPG tropes such as dungeon delving. It needs to be noted as well, that Legendary Games’ adventures spend less space than PGA’s on suggesting non-violent task resolution. All of the above aside though, and Trail of the Apprentice is a really nice series of adventures that I’m looking forward to running when the children are a bit older. Outside the big two of fantasy RPGs, No Thank You, Evil! 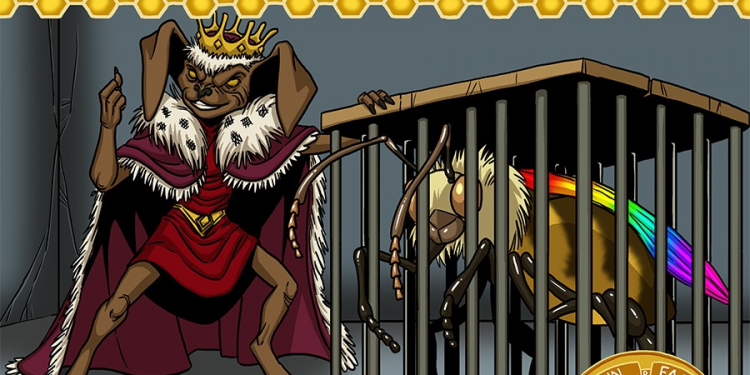 By Monte Cook Games strips down the already lean Cypher System even further to present a family friendly game that I haven’t read but know I will get to sooner than later; No Thank You, Evil! has great word of mouth, and I really like Monte Cook Games’ other games. Evil Hat Productions’ Young Centurions is a FATE Accelerated game of teenage pulp heroes. 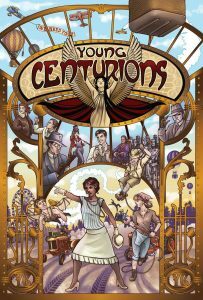 Young Centurions is a great read and an exciting setting for those who are looking for something other than typical fantasy/sci-fi. FATE Accelerated is also a fantastic system for first-time players. It provides the structure that the game needs while keeping out of the way of the story being created. Do you have suggestions or ideas regarding this topic? Any favourite kid-friendly roleplaying games or adventures? Let us know in the comments! Ah spring break. A glorious time full of fun and excitement and a break from the monotony of every day life. And as a work from home mother of three small children with no child care, it is also a really long two weeks where I struggle immensely trying to juggle work and rugrats intent on getting up to no good (I believe it was day two that Rugrat #2 shoved half a dozen smurfs into the baseboard heater while I was showering). Gardening, baking, colouring pictures, and Pokémon Go can go a long way, but Ken and I decided spring break was also the perfect time to break out another RPG adventure for the kids. 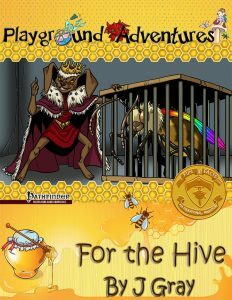 We agreed it was time to play For the Hive, a really well reviewed adventure written by J Gray and published by Playground Adventures. I thought it could be fun to add a fourth player to our game, and I suggested we try bringing another child into the mix. So a couple of weeks ago I called the mother of Rugrat #1’s best friend. It was an awkward call because I have never broached the topic of RPGs with other parents. “So, uh, hi Parent! Do you have a minute? I wanted to talk to you about something.” Immediately I realized it sounded bad, like her child had done something wrong. She was driving, using her car’s speaker phone, so there was also that awkward bit where you feel like you have to talk extra loudly while introducing role playing games to someone when you can’t even see their face to gauge their reaction. She’s awesome though, so with the promise of letting her look over the adventure before we played it, she said it was a go. A week and a half later, the first Saturday of Spring Break, was the big day. Rugrat #1 & #2 were bouncing off the walls with the impending arrival of Friend 1, who arrived grinning ear to ear. Getting the game started proved a bit tricky. We had gone ahead and premade the characters for the kids, guessing what type best suited Friend 1. The sheets were bang on, but the lure of the pawns, tokens, and visible map were strong. The kids kept trying to play them like a board game and had trouble listening. Eventually, with food in their bellies, Rugrat #3 safely in her crib for a nap, and pawns and character sheets sorted out, we began. Here is where I jump in and say that if you want to read a review of For the Hive, you can find Ken’s here. There are also some reviews with the product here. With everything set, the adventure began. Ken adjusted it slightly, setting it at a nearby library we like to visit, but as written, the adventure makes it easy for players to become invested – who doesn’t want to help a friend, and save a bee hive while they are at it? Friend 1 sat quietly and super still, listening intently as the story unfolded. Rugrat #1, who is seven next month, squirmed and wiggled, which is typical for him. 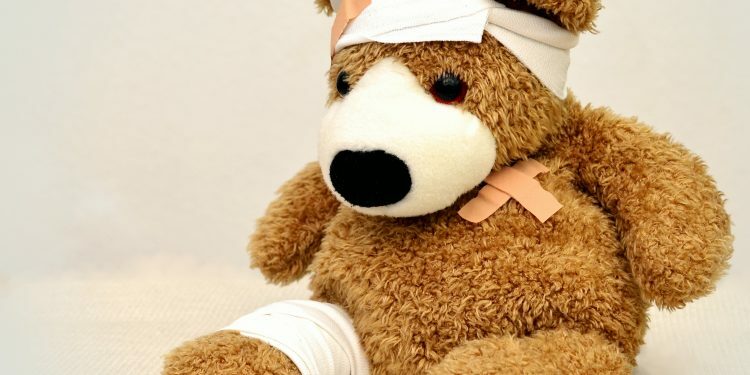 The key things Bzzercup had to say could have been stressed better to the kids (the Rugrats had trouble focusing), but that was not the adventure, it was our kids and the delivery of those facts – a good reminder not all kids focus as well as Friend 1! GMs playing with kids for the first time: remember your audience! Rugrat #1, who is an anxious child, had a lot of difficulty with the idea of shrinking in size, even when we stressed it was just pretend. 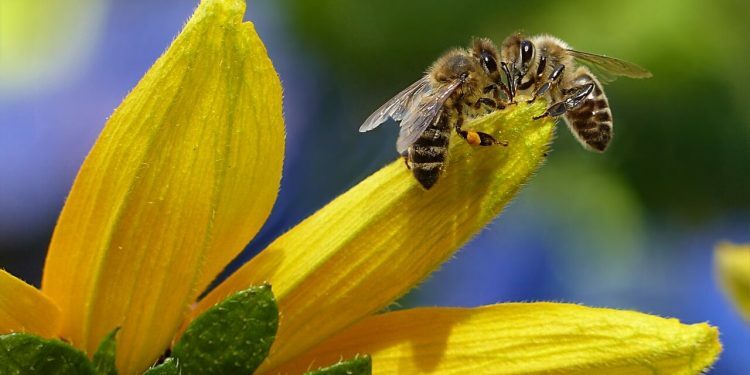 With some convincing from Friend 1, he reluctantly agreed, and we were are able to set off across the grass to the hive. Here the beautiful map came into the play. The kids loved this map, and we had to run off to print a few extras (how hard sharing can be). One of the big things I noticed running this adventure for kids is how much (at least mine) needed to be reminded we were doing this together, that we were a team, and that we all had to help each other. It’s a hard thing to learn – accepting you won’t excel at everything, but that what you may not be able to accomplish someone else on your team can. A great example was the magical looking glass lost in the huge expanse of grass. Rugrat #1 was super upset he couldn’t activate it, but I pointed out that without him we wouldn’t have even known what is was or what it could do. Teamwork let us jump forward across the lawn (but downside – he didn’t get to come across the praying mantis he saw in a piece of art, and there was a bit of an upset about that). Simply put? They succeeded in the goal of the adventure. And not all groups do. There were some hurdles though. One major thing Rugrat #1 had trouble with is things not going his way. This is a fun little educational adventure, but (much like any other RPG session) the joy gets sucked out a bit when a player throws a tantrum and storms out of the room because his dice aren’t rolling well. After being given the chance to calm down, Rugrat #1 did rejoin the party, and he was just in time for the big final show down. Rugrat #2 remained quiet for most of the adventure, chiming in during combat to grin and yell “I hit it!” (naturally we made him a barbarian). He was feeling a bit under the weather and lounged across his chair, with his feet on me, or sat on my lap for most of the adventure. When Ken and I game we sit in the basement on a big day bed with a table nearby. It’s super comfortable. It’s also a space that would have kids bouncing all of the place and playing with pillows. Be sure to find a space the kids can focus, but everyone can be comfy – sitting on our hard wooden IKEA chairs for a couple of hours with a four-year’s bony bum wiggling around wasn’t exactly ideal. Rugrat #1 and his friend told us they had completed a unit on bees in school, and knew most of the bee facts that were shared during the adventure, but Ken and I found them interesting. I would recommend that anyone GMing to the younger crowd makes a point of these facts. It is really easy for them to get lost in the excitement of the adventure, and they are pretty interesting (plus a great educational take away).